Melvyn Bragg discusses the 8th century manuscripts that united the Celtic and Roman church and cultures in England, and are often seen as the first artworks of Christian Britain. Melvyn Bragg and guests discuss the Lindisfarne Gospels. In 597 Pope Gregory the Great ordered that a mission of monks be sent from Rome to convert Britain to its own brand of Christianity - lest it be submerged by the pagan beliefs of the Anglo-Saxon overlords. Just over 100 years later, the Lindisfarne Gospels were produced - lavish and ornate manuscripts, central to the story of how Britain came to be unified by the flag of the Roman Church – and they came to embody a set of beliefs and ideas that dominated Britain for a thousand years. Was the Rome mission in the 6th century the only strand of Christianity to sweep through Britain? Why did Northumbria become a key battleground for ideological dispute? 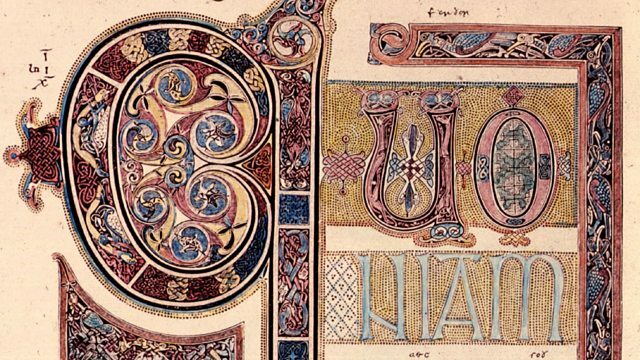 How successful were the Lindisfarne Gospels in unifying the different strands of Christianity? To what extent did they serve as a founding statement of Christian identity in Britain?With Dr Michelle Brown, Curator of Illuminated Manuscripts at the British Library and author of A Guide to Western Historical Scripts: From Antiquity to 1600; Dr Richard Gameson, Reader in Medieval History at Kent University and editor of St Augustine and the Conversion of England; Professor Clare Lees, Professor of Medieval Literature at King's College London and author of Tradition and Belief: Religious Writing in Late Anglo-Saxon England.